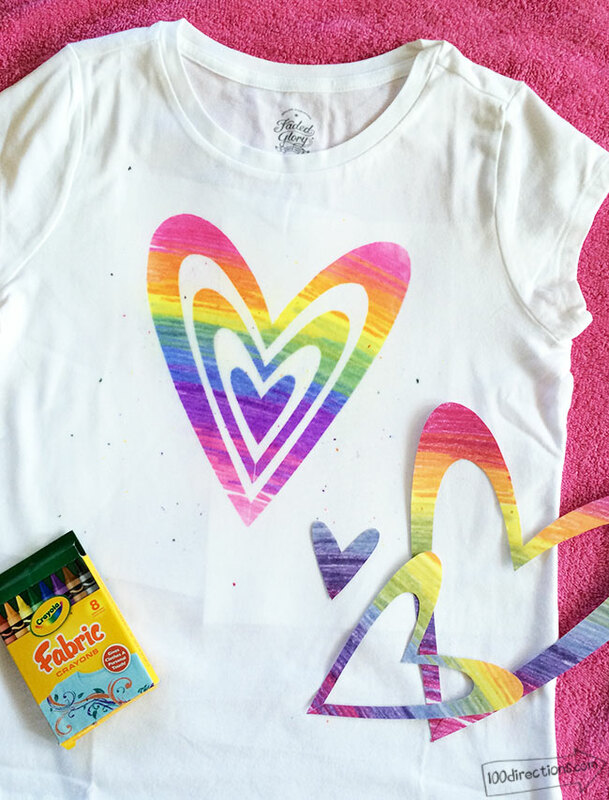 Did you ever make crayon art t-shirts as a kid? I remember making them way back in about 3rd grade and LOVED the idea of being able to just color a picture and iron it on to a shirt for my own custom art. Well crayons are not the same these days and they don’t iron on like the used to. Thanks to Crayola, you can still make fun crayon art with your kids! 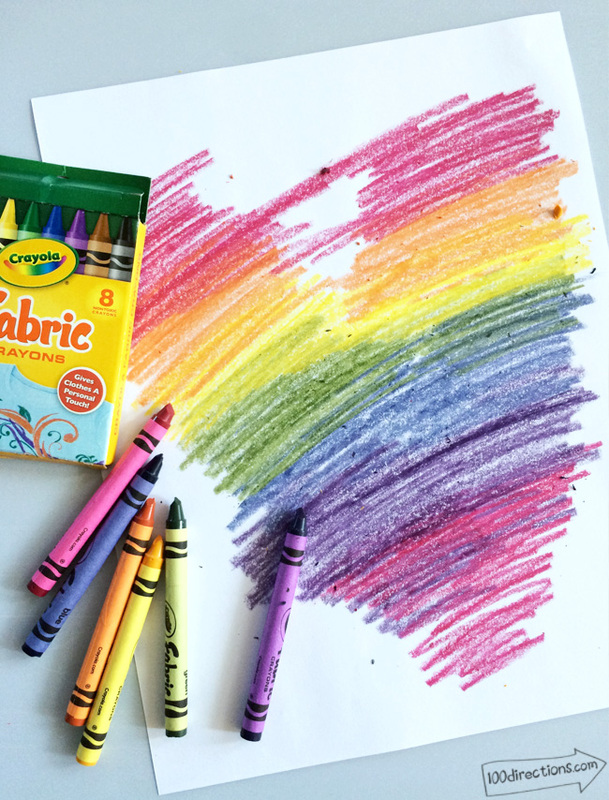 Just make sure to look for Fabric Crayons – I found mine at Target. Hi creative friends! I’m Jen and I’m excited to be sharing this family fun craft with you today. I really love all kinds of creative fun. Projects that can be created by the whole family are some of my favorite. 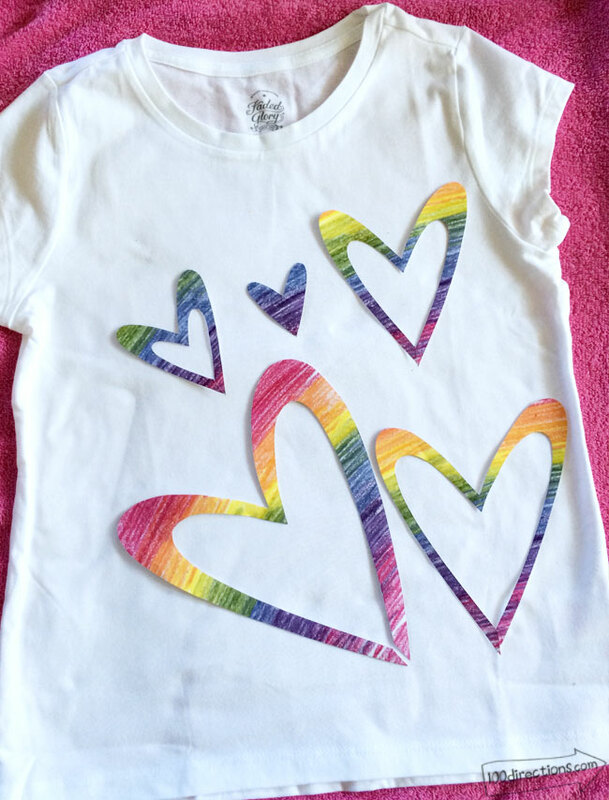 You can make rainbow art projects using my free printable heart page, or grab your own pretty coloring pages and have at it! The beauty of using crayons to make this pretty art is that you can use any colors you’d like. 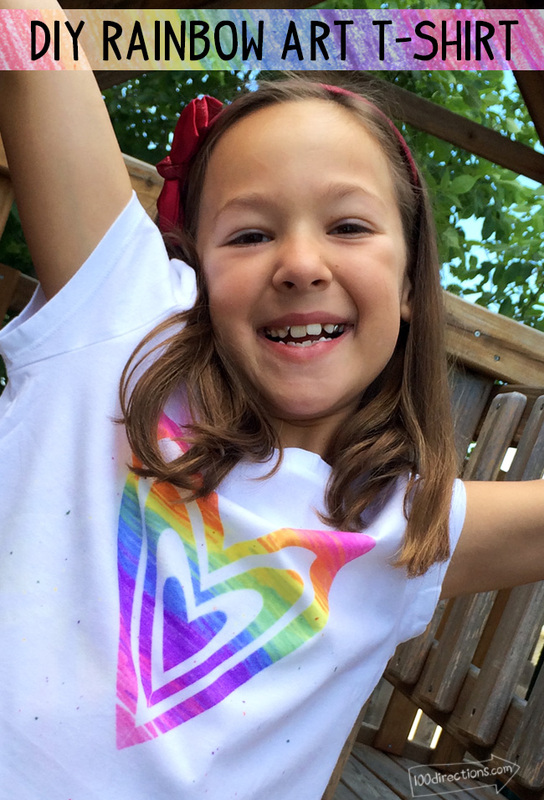 You can make rainbow art like I did, or choose your favorite colors to make your wearable art. 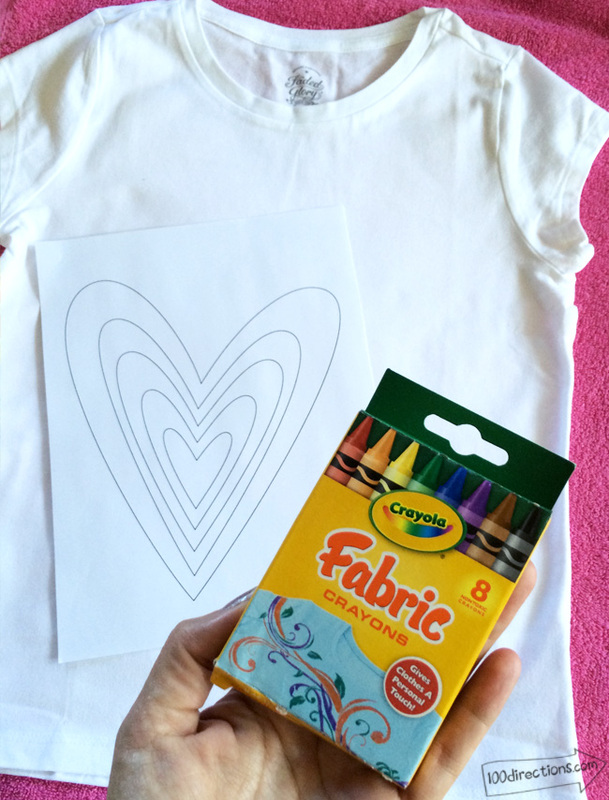 Also, using crayons to make art t-shirts make it easy for even your little family members to join in. Just about every can color on paper, right? Set up your ironing station with the old towel or ironing pad and turn the iron on. I set my iron to the cotton setting, but check the crayon instructions to be sure. Print out the heart printable on plain white paper. Turn over the paper and color on the back of the print out. To get the rainbow look, color rough stripes of color in the rainbow color sequence – red, orange, yellow, green, blue and purple. I added red again at the end. You want to make sure to really cover the paper, over coloring is better than not coloring enough. Also, the crayons may look not as pretty and bright as you’d like. Trust me, they will change when you iron them on to your t-shirt. 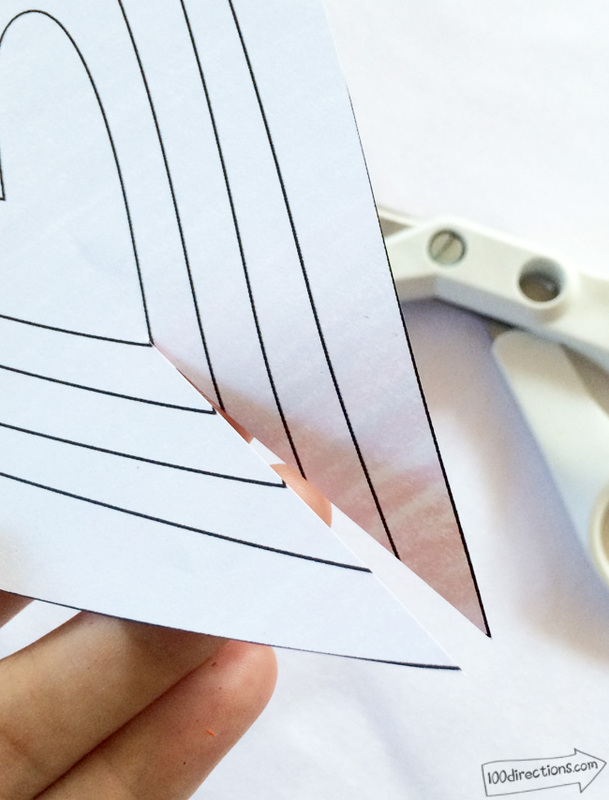 Using your scissors, cut out the shapes on the print out. This is why you colored on the back, you can still see the design lines on the front! Tip: to cut out the hearts easily, make a small cut through the bottom center of the hearts. Place paper inside the shirt to protect the back layer of fabric from color leaking through. Iron on your art (adults only please). Place the colored art, crayon side down, on the fabric. Place a piece of parchment paper on top of the art and iron for 30-60 seconds. Again, check your crayon package to be sure the instructions are the same. 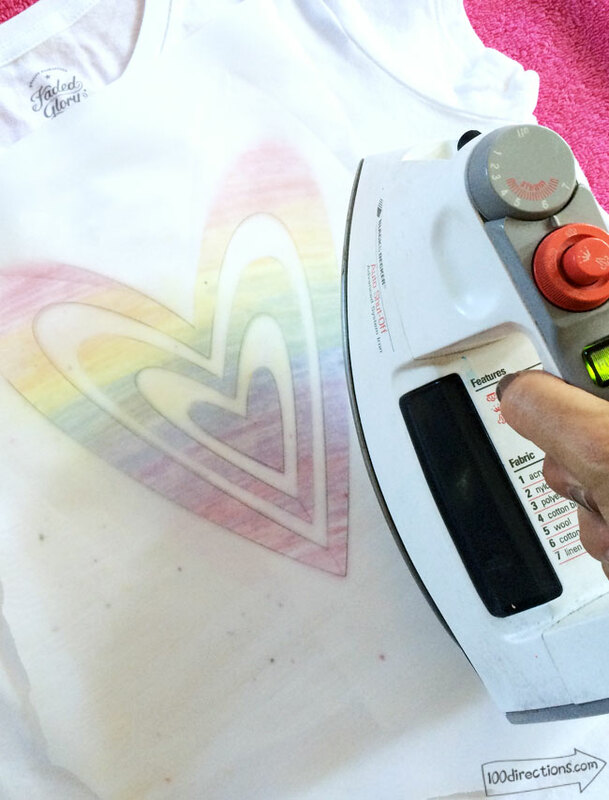 As you iron, you will see the crayon color coming through. You can lift an edge of the colored page to see if the color is transferring to the fabric as you’d expect. For my project, we had some specs of loose crayon wax that ended up on the fabric. I liked the look so I added more on purpose and ironed them in. That’s it! You can customize your own t-shirt art however you’d like. Choose your own design, use your favorite colors, even add some kind of text. Remember, if you do add words to your t-shirt, the letters and words need to be the mirror image (backwards and in reverse) of what you’d really like it to look like. Grab your free printable art coloring page by Jen Goode and a t-shirt and go have some crafty art fun today! I hope you have fun with it and would love to hear what you create! I had no idea this was possible on shirts. I have a two year old who would LOVE this. Thanks so much for posting this! Coolest kids project ever, right? So many ways to be creative with it. Enjoy!